Akiyama’s impression cylinder design uses ceramic jackets to assure high quality printing. With its compact design, J Print takes up less space and makes working around the press easier, resulting in faster makeready and less fatigue of the press crew. As with all Akiyama presses, the J Print has been designed for ease of operation. It is built with rock-solid precision, providing the same low-maintenance, high reliability performance on which we have built our reputation. Both sides of the sheet are printed without reversing or restacking. There is minimal sheet handing resulting in minimal paper waste and extremely high accuracy of register throughout the run. Each upper and lower unit combination has its own Plate, Blanket, Impression and Transfer cylinders for accurate register and high print quality. One pass through the press gives you outstanding quality even on light weight stock. The conventional two-sided printing method requires waiting for the first side to dry before reversing the sheet to print the other side. While waiting to print the other side, sheet instability can set in. The resulting delay often causes paper feeder problems and more waste. The same gripper edge of the sheet is maintained throughout the run providing accurate register between both sides of the sheet. Dot reproduction is sharp and lustrous and there is no difference in quality between the front and back sides. Cylinder grippers and gripper bases are manufactured from ultra hardened steel. Needle bearings are used in the grippers on the impression and transfer cylinders to reduce friction. There is no difference in printing quality between front and back of the sheet. Perfector printing with Akiyama’s original Impression Cylinder configuration assures you of a matched finished sheet with superior quality on both sides. 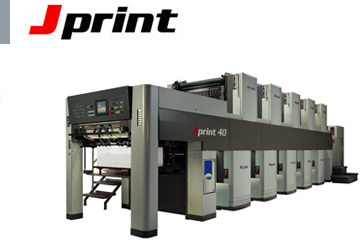 J Print stops all plate cylinders at the same position, permitting plates to be mounted at the same time by one operator using the exclusive Auto Plate Mounting System. Clamping and tensioning of the plates is also automated and requires no tools, further reducing makeready time. Simultaneous plate changing saves time compared with sequential plate changing. The pickup sucker is of a piston type that is mechanically actuated. This ensures stabilized, accurate feeding at operating speeds up to 13,000 IPH. Height adjustments can be made easily, even during the run. The forwarding suckers can also be adjusted up or down, left or right, independently. This provides positive, scratch-free feeding with various stocks, ranging from light-to medium-weight. The unique air separation feature permits running a wide range of stocks, from onion skin to medium weight at maximum speed. A tape slowdown mechanism reduces sheet speed by 40% to ease sheets into the front steps. A venturi air device permits paper that is waved or curled to be flattened at the register position of the feedboard. A misfed or missing sheet is positively detected by three different photocells – the first for over-run sheet, the second for double sheets and the third for misregistered or cocked sheets. The swing mechanism has an upward motion allowing the swing to return to the front stops quickly after sheet transfer. The result is longer lay time for sheet stabilization at high speed. Elliptically shaped infeed cylinder gives smooth acceleration of the sheet into the press. New inker roller train provides optimum control of ink and water for upper and lower units. Results: high quality, consistent printing. Four form rollers of different diameters assure controlled ink laydown. Independent water fountain drives may be set to follow press speed with controls from Delivery Control Panel. Ink train and plate temperature can be critical in some applications especially when running waterless plates. For these situations, Akiyama offers a system to maintain proper temperature by circulating water through the ink oscillating rollers. The Akiyama wash-up system is remotely controlled from the Delivery Panel, providing consistent control of solution, bridge roller position and wash-up tray. Time and expense are greatly reduced. The ACC console provides the operator with precise ink control, lateral/circumferential register, store job information and interface with other systems. The Auto Plate Changing System allows mounting of all plates on the top or bottom cylinders at the same time. It then clamps and tensions the plates without the use of tools. Cylinder positioning for opening and closing of the clamps is preset for ease of plate insertion and removal. Plate cocking for registration is controlled from the console. Accuracy is precisely controlled by digital electronics. Two cocking adjustments are offered – adjustment of the plate on the cylinder (+-0.5mm)and skewing of the plate cylinder to the blanket cylinder(+-0.15mm). This feature decreases makeready/change over time by allowing the operator to input a new stock caliper at the console. The system then remotely resets each unit’s impression setting for the new caliper. This feature decreases makeready/change over time by allowing the operator to input a new stock size at the console.